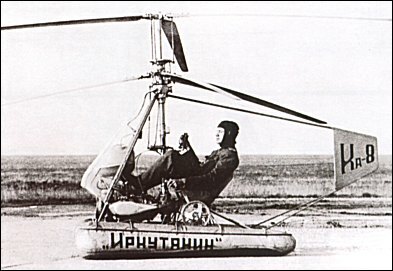 In attempting to produce a "flying motorcycle", or a light single-seat helicopter of the simplest possible structure, the Kamov bureau built the Ka-8 in 1947. It was derived from the Ka-17 (??) designed two years earlier, making use of the system of twin coaxial, contra-rotating rotors which dispensed with the need for a tail rotor. The low output of the two-cylinder motorcycle engine and its unsuitability for aeronautical use handicapped the aircraft, and in fact only three were built. Official disinterest in autogyro made Kamov switch to helicopters, and he decided to build one-man Vozdushnii Mototsikl (flying motorcycle) for civil or military use. Main design effort on coaxial rotors, each with three built-up wooden (mainly spruce) blades of NACA-230 profile with glued construction and fabric covering. Metal root held in hub with drag and flapping hinges driven by superimposed swashplates moved directly by pilot. Rest of airframe welded steel tube, with pilot and fixed fin at rear and engine and fuel tank at front, resting on two pontoons of rubberized fabric. Reported to have taken 18 months before permission granted to organize small informal group and build Ka-8. First flown 1947, pilot Mikhail Gurov. Handlebar flight control replaced by vertical collective and cyclic levers, pontoons tapered front to rear, and fin changed to rudder driven by pedals. At least three built, one displayed from truck at 1948 Tushino show.